During the past year or so there has been a large influx of entry-level smartphones in Pakistan. Despite the competition, Infinix hopes to stand out from the rest of the crowd by providing feature rich phones at basement prices and the next step towards that is the all new Hot 5. We got our hands on a review unit and here’s what we think of it. The Infinix Hot 5 features a plastic build with the distinguishing feature being the textured back, which helps with the overall grip and handling of the device. The phone is light – perhaps lighter than it should be as it lacks the substantial feeling when you hold it in the hand. On the front of the device you have the 5.5-inch screen with a front facing camera on top, an LED flash and the earpiece/loud speaker. You’ll also find the dual front facing speaker grilles up front flanking the screen on both sides. On top of the phone you have the 3.5mm earphone jack while on the bottom you’ll find the microUSB port for charging/data syncing and the primary microphone. The right side of the phone houses the power button and the volume rocker. Moving on to the back side of the phone, it has a nice textured feel to it. 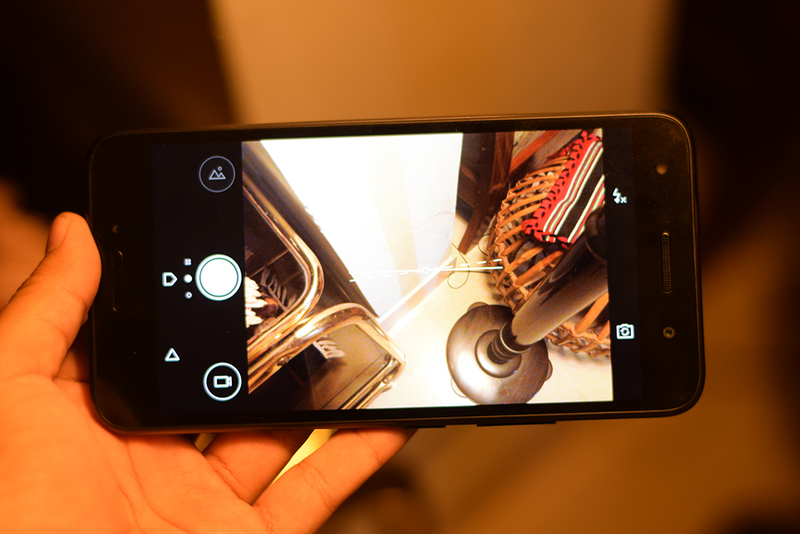 You’ll also find the primary camera and the LED flash located on the top left corner of the phone. The fingerprint scanner is located at the center of the phone making it very easy to access. The back is also removable but unfortunately, the battery is not. At least not without a set of screw drivers. Not that you would need to remove it in the first place given its capacity. 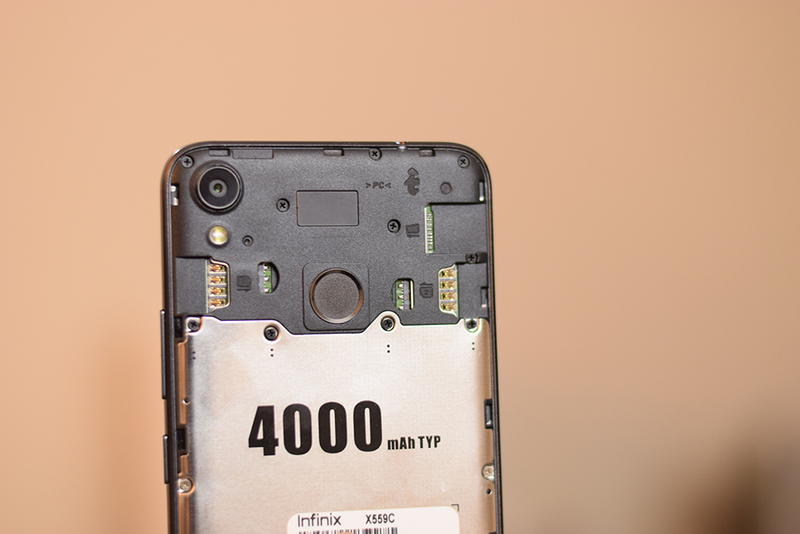 Removing the back cover gives you access to the dual SIM slots and the dedicated memory card slot. Moving on to the display, it’s a pretty standard one with a 5.5-inch IPS panel. At this price point, the 720×1280 resolution is about what you would expect from smartphones in similar range. Other than that, the display offers nice color reproduction, good contrast and decent viewing angles. Negatives include the brightness, which makes it difficult to view the display in direct sunlight but it’s a complaint that’s common to many entry level smartphones. Being a budget smartphone, you shouldn’t expect flagship like performance for the Hot 5. However that doesn’t mean the phone’s performance is bad by any means, far from it. Let’s get the numbers and benchmarks out of the way first. The processing power for the Hot 5 comes courtesy of the a Mediatek 6580 quad-core chipset clocked at 1.3 GHz. Backing this up is 2 GB of RAM. 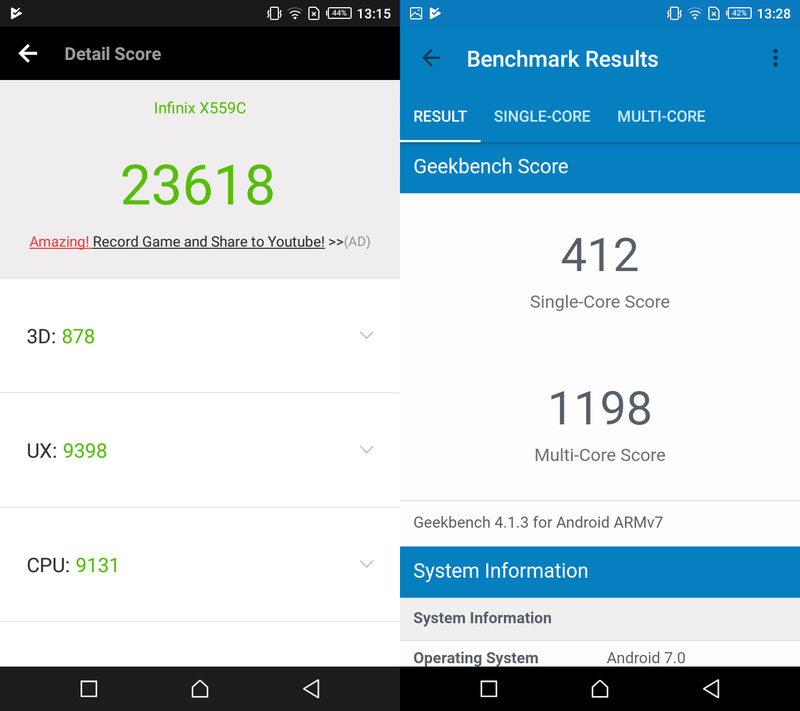 You can take a look at the benchmarks results below. Real-world performance is decent considering the chipset. The Hot 5 held its own and performed well. For a casual user it is more than good enough and you won’t have any trouble navigating through the UI and applications. Launch time for most 3rd party applications is respectable. On the whole, for majority of users out there the Hot 5 won’t be a disappointment as it runs fine through your day-to-day tasks. The Hot 5 has a 8MP primary camera with a powerful LED flashlight on the back. The front has a 5MP shooter that also has an LED flash of its own. The camera application is very simply laid out and the interface is easy for first time users as well. There’s a shutter button on the bottom of the display flanked by the options for the video mode and gallery. Up top you just have your toggles for front/rear facing camera and the LED flash. Swipe to the left and you’ll find the HDR Mode and other various settings while swiping to the right revels different capture modes for the camera such as Normal, Professional, Beauty etc. Coming to the actual results of the photos, they were rather good. In good daylight conditions, photos had enough detail and the colors were bright and not overly saturated. Low light samples, however, weren’t as good — as is the case with other phones in the price range. You can take a look at a few camera samples below. The Hot 5 has a large 4,000mAh battery. Combine that with a low-res screen and a not-so-powerful processor and you get some excellent battery timings. The Hot 5 had enough juice to last me through a complete day which consisted of running some benchmarks, checking social media, taking photos and some other day-to-day stuff. A light user will get even better battery life out of the Hot 5. Another thing that I really liked about the Hot 5 were its speakers. Infinix calls the Hot 5 a “mobile cinema” and while the claims falls short considering it’s resolution, the front facing dual speakers were a delight. In fact, the audio quality surpasses even some flagships I’ve used and definitely top of the pile when it comes to budget phones. They are loud, there’s barely any distortion at high volumes and they are stereo too! 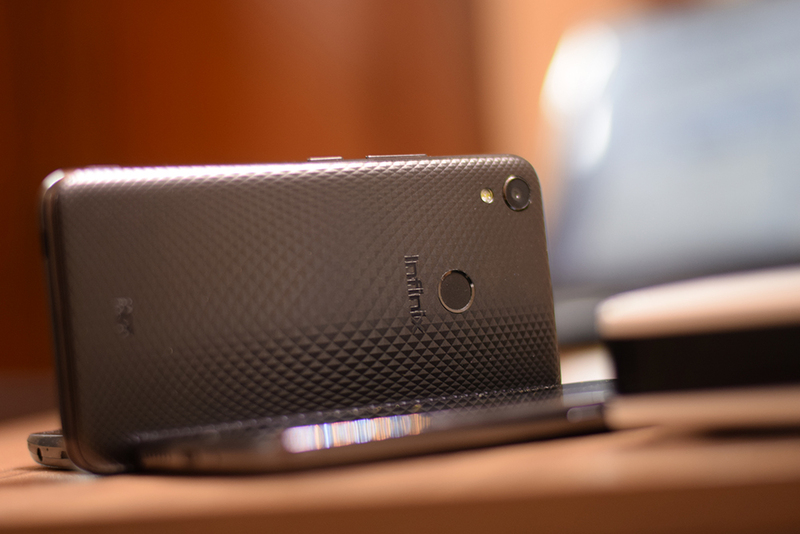 Infinix has done a good job with the Hot 5 making sure that you don’t notice that it’s a budget phone. For the price I’d say the Hot 5 exceeded my expectations. Although the build quality is a bit tacky, I liked the textured back. The display is good for what it is, day-to-day performance is satisfactory (albeit not for a power user), camera is decent as well. Better than Q Mobile Bus !. Pro pk kitni paise de rahe he per comment k? Slow 533Mhz RAM module (4.3GB/s). Can’t comment on cameras, build quality and display quality. Save up and get The Nokia 3 with slightly better MT6737 SoC which has 64-Bit architecture, faster Cortex-A53 CPU, faster Mali-T720 GPU, 4G LTE CAT4 Modem, a tad faster RAM (640Mhz @ 5.1GB/s), Stock Android experience, GREAT build quality and planned update to Android Oreo and Android P! It lack The big display and battery though, but it’s better in any other way. Xiaomi Redmi 4A is also a great option with Snapdragon 425 although you’ll have to deal with the absolutely appalling MIUI! And I hate to say it but, Qmobile Q Infinity also has a Snapdragon 425 with a 5.7″ 2:1 display! Start xiaomi once and u will forget all such crap….